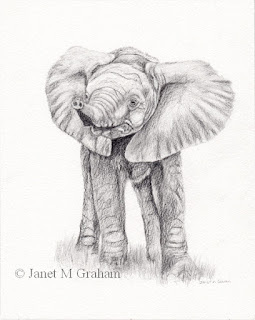 It has been ages since I have done a pencil drawing and I just couldn't resist drawing this cute baby elephant. I draw it on the NOT watercolour paper as I wanted more textured surface as oppose to a smooth one. Really pleased with the how the drawing turned out. Baby Elephant 2 measures 8 x 10 inches and is drawn on Daler - Rowney 'The Langton' NOT 300gsm watercolour paper. Country Tree measures 6 x 6 inches and is painted on Ampersand Gessobord Panel. For something different I decided to paint a few aceo seascapes inspired from watching the waves down at Suttons Beach, Redcliffe on the weekend. Normally it is pretty flat but the wind was blowing so the sea was a lot choppier. I don't normally use a medium when painting the little aceo's but for this I needed to in order to get the depth and colour of the feathers right. This one was also a trial run to work out the colour combinations for the larger one I am planning on painting. 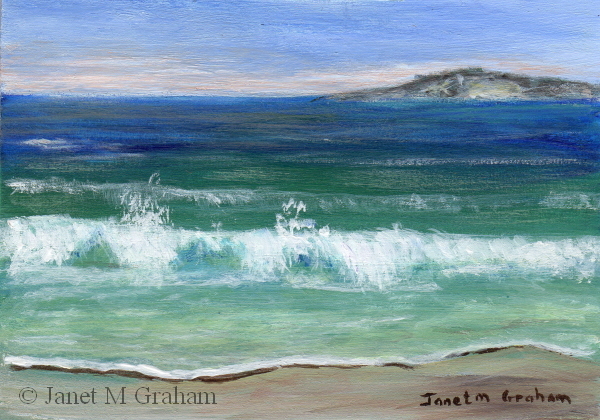 It will also be perched in a similar position but will be 6 x 8 inch. I found the perfect colour combination for the breast feathers - cobalt blue and permanent alizarine. The highlighted areas are transparent red oxide with a touch of transparent yellow. 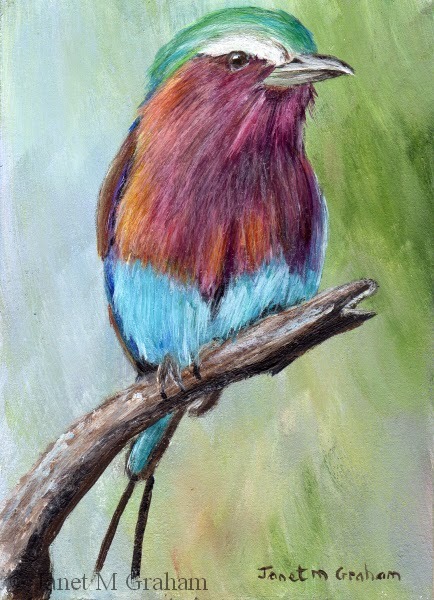 Lilac Breasted Roller measures 2.5 x 3.5 inches and is painted on 300gsm smooth Arches watercolour paper. 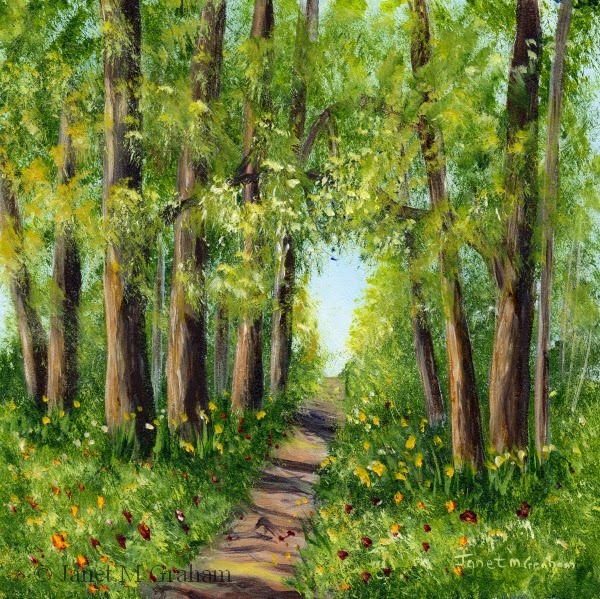 This is the next one I painted. I had to work a bit on the background to get affect I wanted but it come together in the end. Yellow Bellied Eremomela's are found in Africa south of the Sahara. They measure around 10 cm in length and weigh about 9 grams. 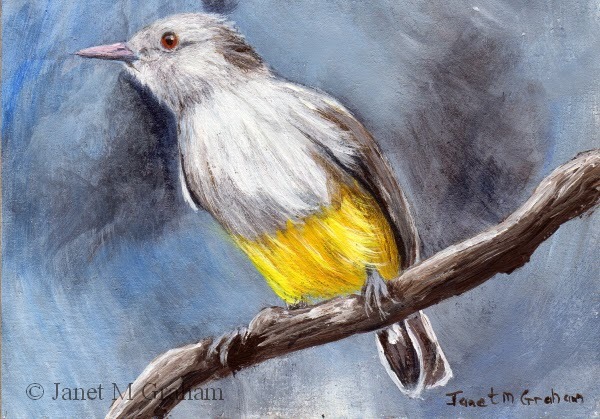 Yellow Bellied Eremomela measures 3.5 x 2.5 inches and is painted on 300 gsm smooth Arches watercolour paper. I love the pose and the vibrant colours of this one. Really pleased with how it turned out. 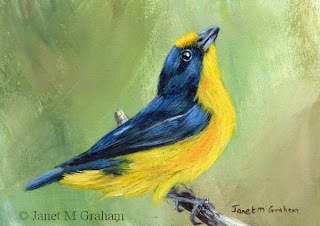 Violaceous Euphonia's are found in South America. They measure around 11.4 cm in length and weigh about 14 grams. Violaceous Euphonia measures 3.5 x 2.5 inches and is painted on 300gsm smooth Arches watercolour paper. I used quite a few glazes to get depth and colouring to the feathers. I use a Fast medium / fixer by Atelier for the glazes which works really well. Really pleased with the final painting. 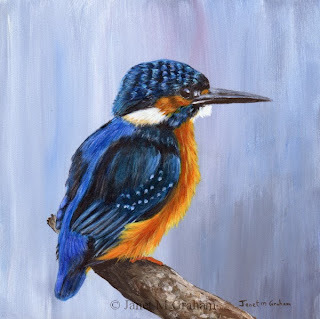 Kingfisher measures 6 x 6 inches and is painted on Ampersand Gessobord Panel. I decided to paint a larger landscape on the loose canvas. I was fun to paint and I am really pleased with how it turned out. Bluebell Woodlands measures approx. 11 x 14 inches and is painted on loose unstretched Fredrix Canvas. I find the hardest part is trying to find a title for a painting. Bird and animals are so much easier to name. 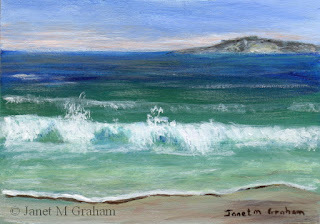 I painted some seascapes which I will post in the coming weeks and they are even harder to think of a title for. At least with a landscape I can play around with words of forest, woods, path, spring etc. Sure think of something in the end. 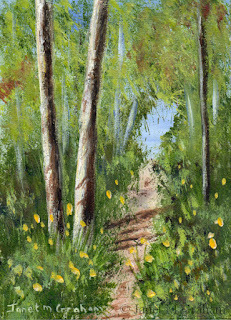 Woodland Walk measures 6 x 6 inches and is painted on Ampersand Gessobord Panel. 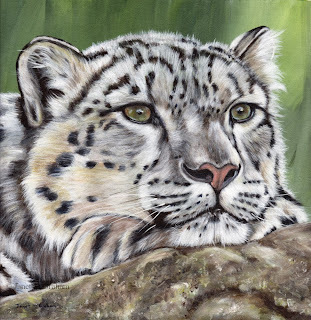 I really enjoyed painting this one in the larger format - it is just easier to see the details and the subtle change in colours. Really pleased with the final painting. 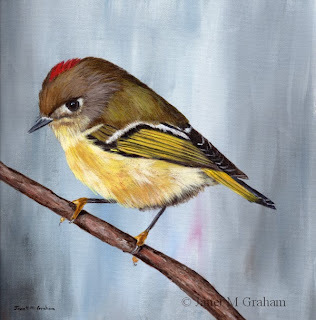 Ruby Crowned Kinglet 2 measures approx. 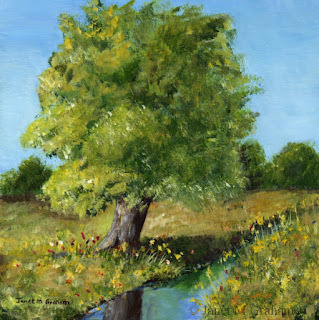 12 x 12 inches and is painted on loose unstretched Fredrix canvas. For the next one I painted this one - love it's colouring - added a bit of raw umber to darken the plumage which works rather well so I must remember to add it to my standard palette. Black headed grosbeak's are found from south western British Columbia through to the western half of the US and into Central Mexico. They measure between 18 - 19 cm in length and weigh around 47 grams. I painted this one a bit differently to normal. 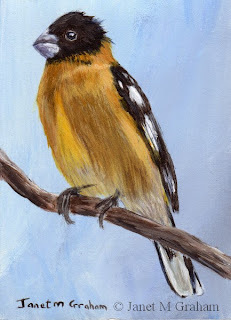 Normally I paint the bird on top of the background but as I wanted a dark background, I had to paint the background around the bird and soften the edges. Worked rather well and I am rather pleased with the final painting. 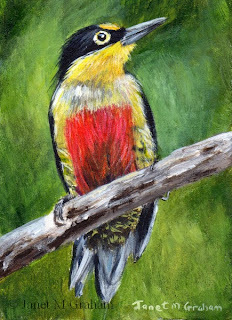 Yellow Fronted woodpeckers are found in Argentina, Brazil and Paraquay. They measure around 17 cm in lengh and weight between 50 - 64 grams. The male has a red crown so this one is a female. Yellow Fronted Woodpecker measures 2.5 x 3.5 inches and is painted on 300gsm smooth Arches watercolour paper. 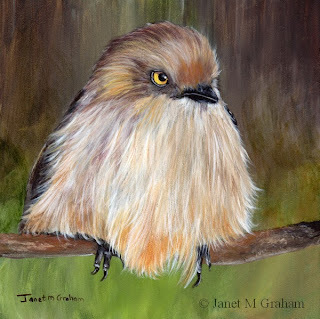 I love how this one is all fluffed up and just couldn't resist painting it. Really pleased with the final painting. American Bushtit's are found in western North America. They measure only 7 - 8 cm in length and weigh between 4 - 6 grams. The male has dark eyes whereas the females are yellow. Bushtit measures 6 x 6 inches and is painted on Ampersand Gessobord Panel. 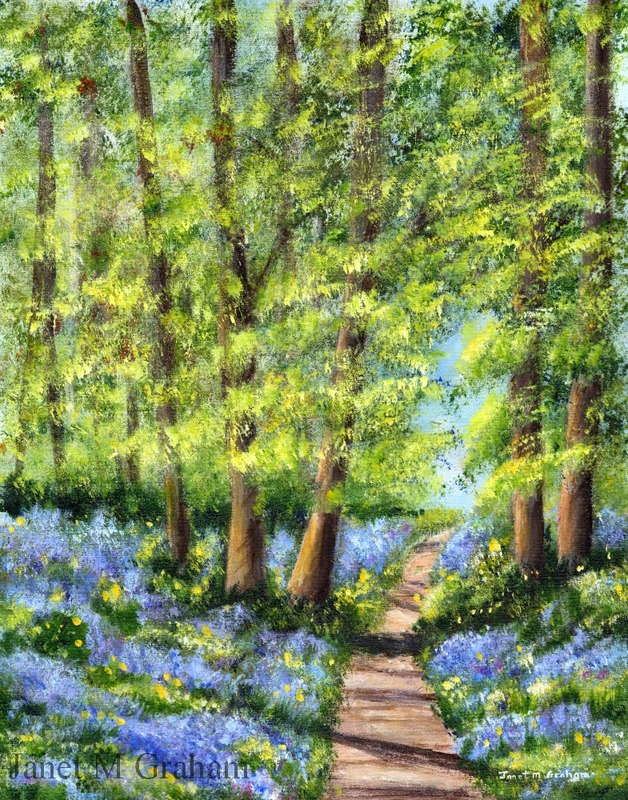 And this was the next one I painted. 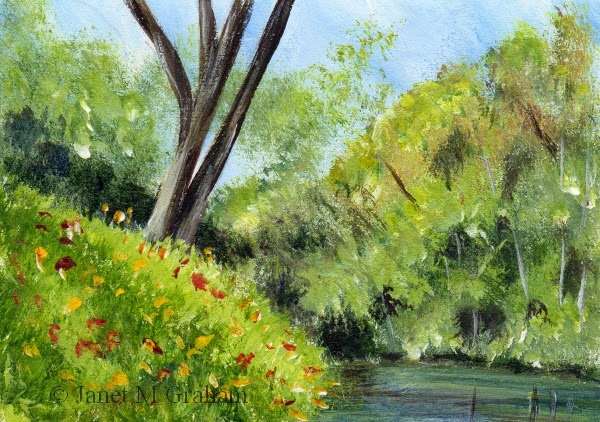 River Bank ACEO measures 3.5 x 2.5 inches and is painted on 300gsm smooth Arches watercolour paper. I felt like painting some little landscapes. This is the first one. 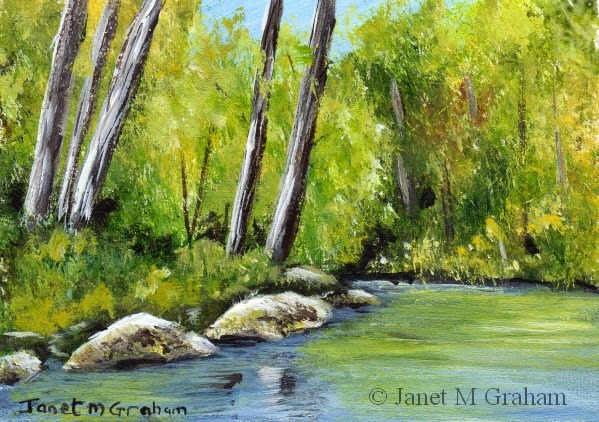 River through the Forest measures 3.5 x 2.5 inches and is painted on 300gsm smooth Arches watercolour paper. Poppy measures 6 x 6 inches and is painted on Ampersand Gessobord Panel. I love how the light hits the mountain on this one. Really pleased with how it turned out. 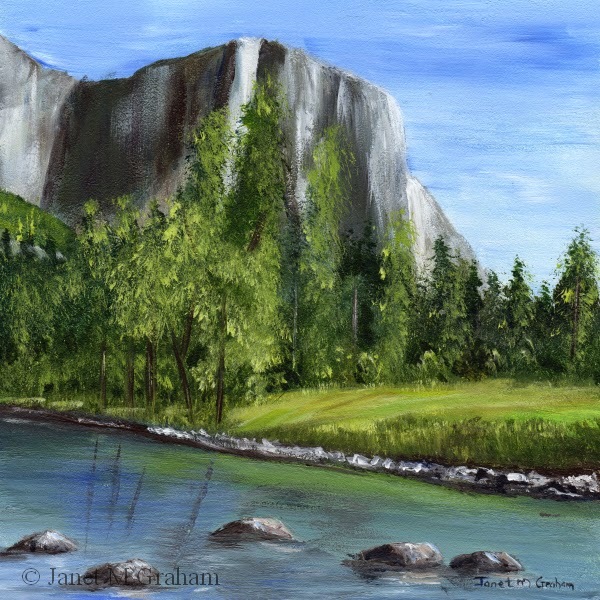 Yosemite measures 6 x 6 inches and is painted Ampersand Gessobord Panel. And after all the birds, I decided to paint this little landscape scene. Really pleased with the depth I manged to archive with this one. 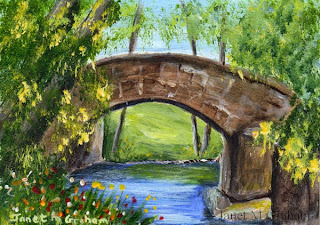 Stone Bridge measures 3.5 x 2.5 inches and is painted on 300 gsm smooth Arches watercolour paper. Many thanks to Jocelyne Perrette for the reference photo. 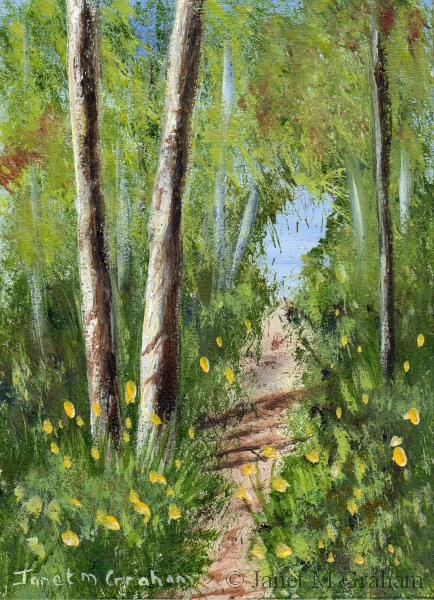 And I couldn't resist painting this one - really pleased with how this one turned out. Crested Shriketits are found on Mainland Australia. They measure between 15 - 19 cm in length and weigh on average 27 grams. 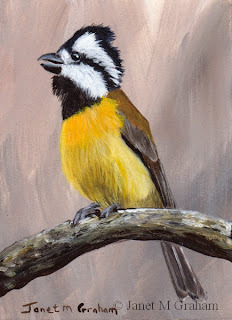 Crested Shriketit measures 2.5 x 3.5 inches and is painted on 300gsm smooth Arches watercolour paper. For my next one, I painting this one. The Bluethroat is found across Europe and Asia as well as in Alaska and Yukon Territory in North America. It is around 14 cm in length and weights between 15 - 22 grams. 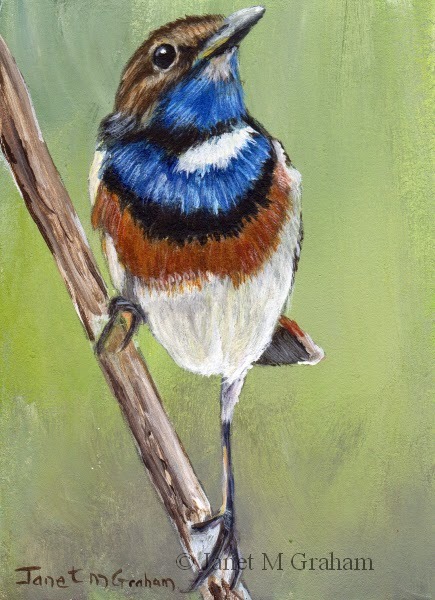 Bluethroat measures 2.5 x 3.5 inches and is painted on 300gsm smooth Arches watercolour paper. 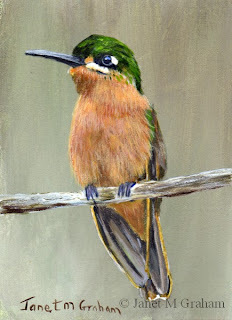 Many thanks to Angeline Rijkeboer for the reference photo. This one was fun to paint. Everything just seemed to work. Anna's hummingbirds are native to the West Coast of North America. They are around 9.9 - 10.9 cm in length and weigh between 3 - 6 grams. 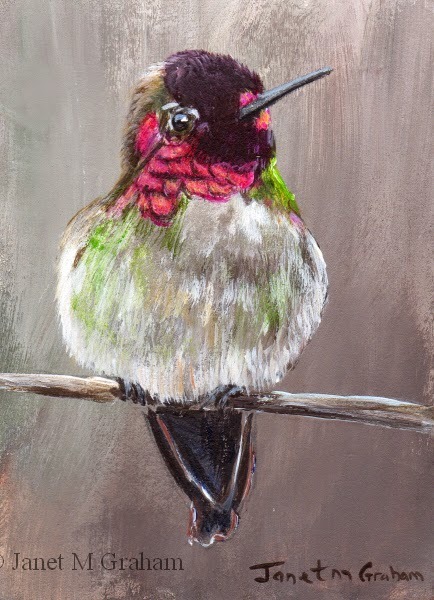 Anna's Hummingbird measures 2.5 x 3.5 inches and is painted on 300gsm smooth Arches Watercolour paper. I had to do a few layers to get the right colour for the body feathers but it was a fun one to paint. Really pleased with the final painting. As the name suggests, these birds are found in Brazil and are part of the hummingbird family. This is the female - the male has a ruby throat. Brazilian Ruby measures 2.5 x 3.5 inches and is painted on 300gsm smooth Arches watercolour paper. I changed this one a bit from the reference photo. Really pleased with the final painting. 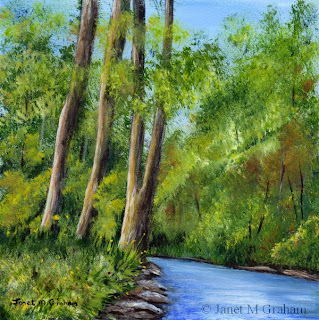 Forest River measures 6 x 6 inches and is painted on Ampersand Gessobord panel. I changed this one a bit from the reference photo. I loved the fence and flowers of the reference photo but the view into the fields was obscured by trees. So I opened it up and added in the cabin. 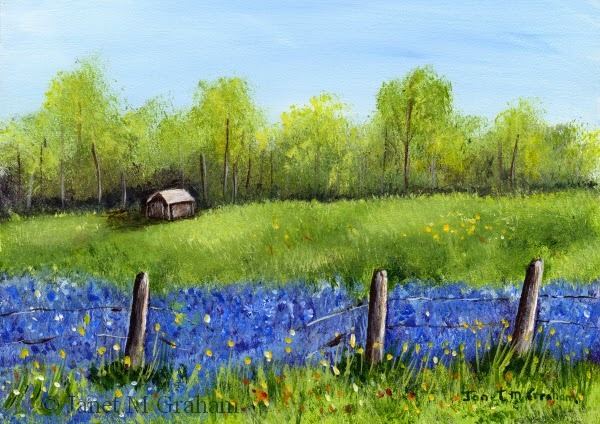 Bluebonnet Field measures 7 x 5 inches and is painted on Ampersand Gessobord Panel. Many thanks to Sandy Wegmann for the bluebonnet reference photo. 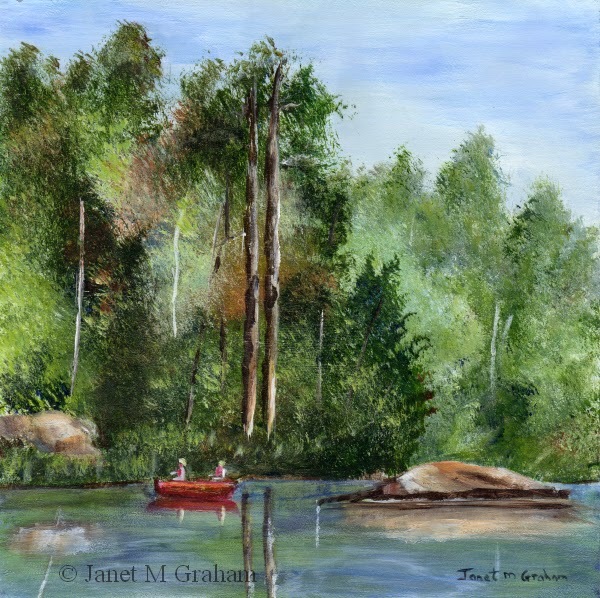 I really enjoyed painting this one - must be really peaceful canoeing down a river (as long as there are no rapids). Canoeing down the river measures 6 x 6 inches and is painted on Ampersand Gessobord panel. Really pleased with how this one turned out. To create the grey feathers I mixed a combination of Ultramarine Blue, Burnt Sienna plus white which work really well. Black Crested Titmouse are also known as Mexican Titmouse. They are found in Texas, Oklahoma and east-central Mexico. They measure between 14 - 15 cm in length and weigh between 26 grams. 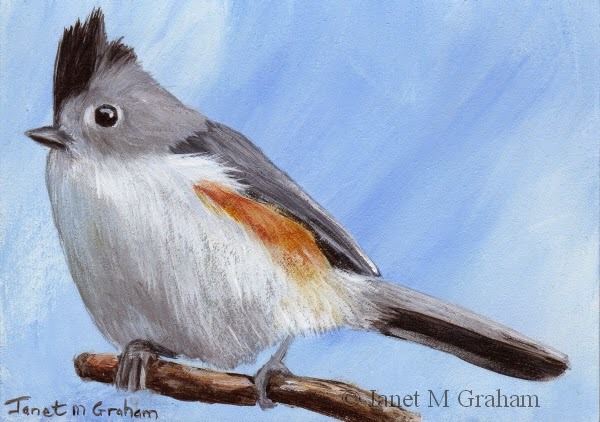 Black Crested Titmouse measures 3.5 x 2.5 inches and is painted on 300g smooth Arches watercolour paper. I have had this one printed out for a while to paint. Like the different angle the bird is sitting on branch. 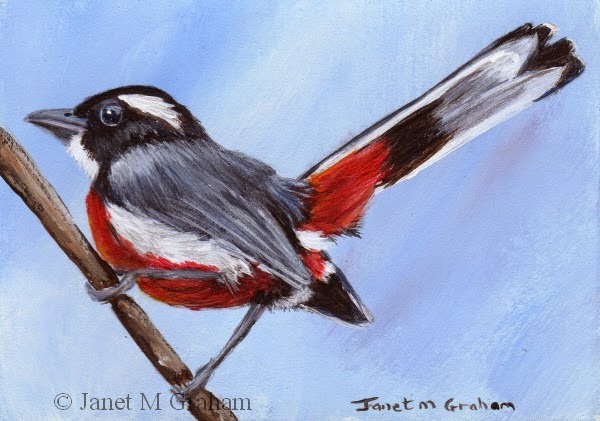 Red Breasted Chat's are found in Mexico. Red Breasted Chat measures 3.5 x 2.5 inches and is painted on 300gsm smooth Arches watercolour paper. I love painting kingfishers. 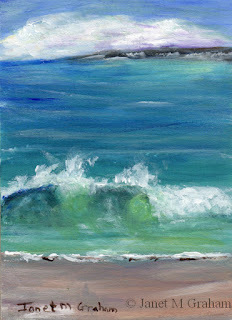 I am planning on painting a 6 x 6 inch one so this one was to work out what combination of blues worked best. I used Phthalo blue, Prussian blue and phthalo turquoise which worked really well. 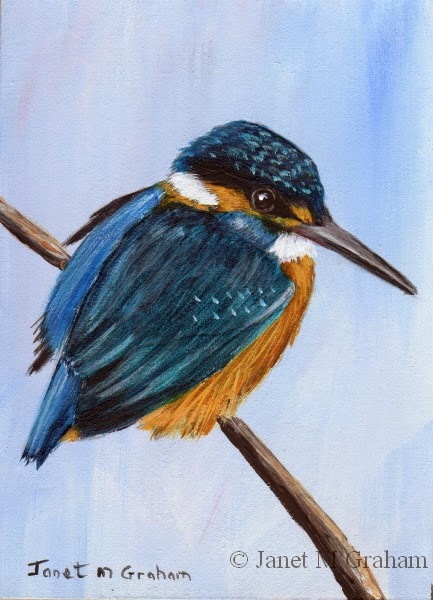 Kingfisher measures 2.5 x 3.5 inches and is painted 300gsm smooth Arches watercolour paper. I love everything about this one. Really pleased with the final painting. I used a lot of glazes to get the depth to the fur and the rock was fun to paint - used my fingers quite a bit in the beginning. Snow Leopard 2 measures approx. 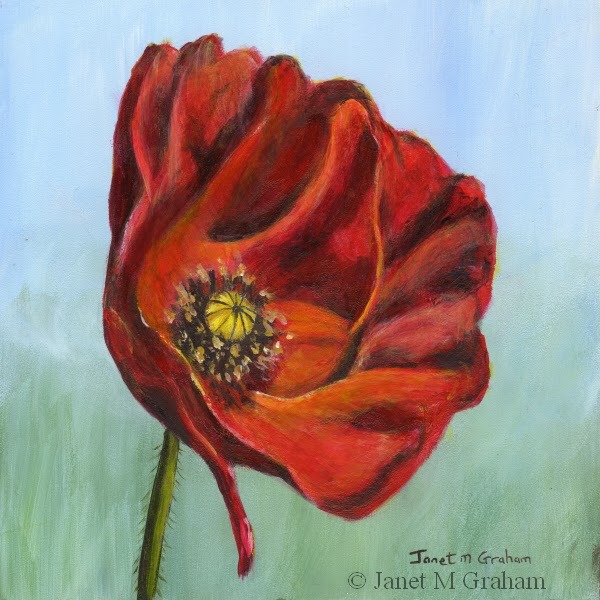 12 x 12 inches and is painted on loose unstretched Fredrix Canvas. Many thanks to Keith Spicer for the reference photo.